Betty & Beryl Teach Radio Pros A Thing Or Two! Cast your mind back to last month and you may recall a mass of international media hysteria around two pensioners from Humberside. 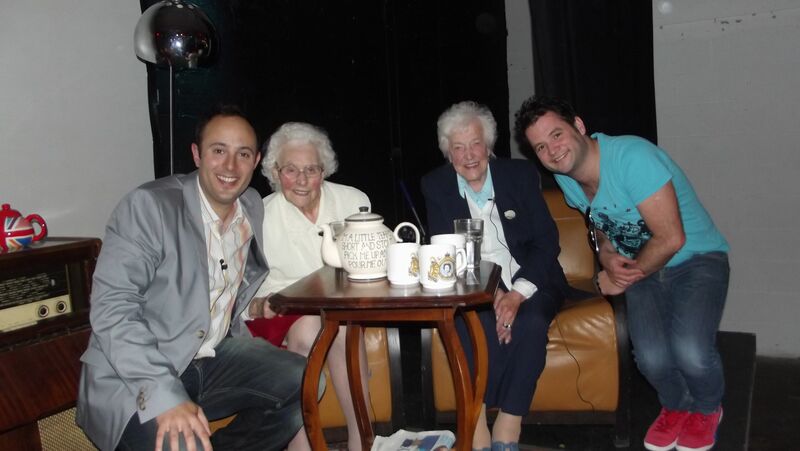 Betty Smith and Beryl Renwick, aged 86 and 90 respectively, became the oldest ever people to win a Sony Radio Gold Award, beating off competition from Frank Skinner and Adam & Joe. “The Betty & Beryl Show with David Reeves” is on BBC Radio Humberside every Saturday at 6pm. Although both David and I work in radio, we are childhood friends. We grew up in the same Hertfordshire town and did local theatre together. (Seriously our bottle dancing in ‘Fiddler on the Roof’ really did convey the inner turmoil of the Jewish community during their expulsion from Tsarist Russia). Whilst David is very noble and modest to step aside from the limelight and let the 2 Bs be the focus of the attention; as most radio people would have gathered, David is the brains of the operation. Not only does he present the show with them, he also produces it and has led it to where it is today. I’m very proud of what my mate has achieved so I went up to support him on a special night….. The Radio Academy, the industry organisation which is also behind the awards ceremony, holds various events throughout the country; and one Tuesday night in June, a market-warehouse in Hull was transformed into a pensioner’s front room for an evening with Betty, Beryl and David, complete with an audience on sofas, deckchairs and loungers munching shortbread biscuits, gingernuts, cake and cream teas. On stage complete with a rug, comfy chairs (of course!) 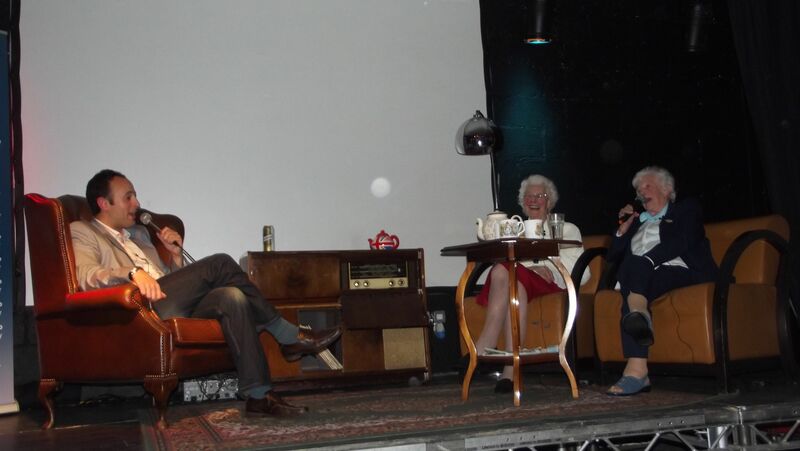 and an old fashioned radio unit – David led a Q&A chatting to B&B and taking questions from a floor full of radio folk. Through listening to their random mumblings on their love of Michael Buble, touching men’s knees and being ‘papped’ in ASDA; a thought struck me…..
For people who work in radio today, their brain is full of worries such as; Hitting vocals*; Forward promoting*; Did we speak too long in that link? Is this link on brand? Timings; Jingles; blah-blah-blah-blah; and here you have two old ladies and a man, regardless of age, having a chat, being open, completely oblivious to all of this, but most importantly of all, being entertaining……….oh and they happen to be on the radio. They’re not bogged down in format and radio talk, they’re just being entertaining. How poignant that regardless of subject, wisdom through old age prevails and to remind a room full of radio folk of the original reason why they got in to the industry, all it took was two sweet old ladies and some biccies. So the one thing I took away about radio: Be Entertaining. Because Beryl and Betty couldn’t give a flying Custard Crème that that sweeper* crashed the vocal on your Rhianna. A Sweeper to them is that little lad during the war who kept their chimney clean. click here to like “The Betty & Beryl Show with David Reeves” on Facebook, and click here to follow David Reeves on Twitter. Hitting Vocals – When the presenter stops talking before a song’s vocal starts singing. Forward Promote – When the presenter says what else is coming up in the show. Sweeper – Is a type of radio ‘jingle’. It’s one with a Voice Over and lots of whooshes and bangs. Crashed The Vocal – This is when you don’t ‘hit the vocal’. It’s when you talk all over, or play a sweeper over the vocal in a song.